Growing up in a small town had it’s benefits. #1 – We knew everyone. 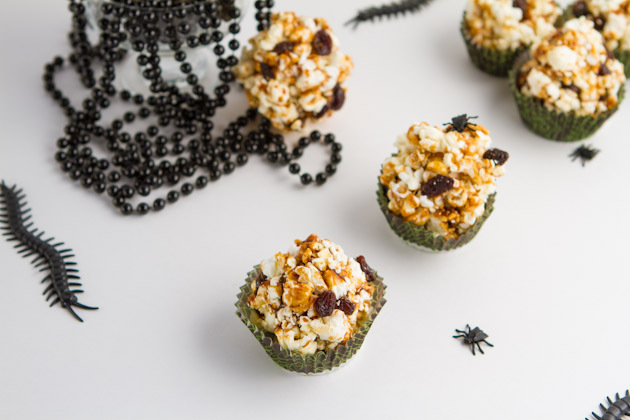 #2 – When it came time for Halloween and we received homemade treats while trick-or-treating, we were allowed to eat them. I remember the first Halloween we spent in the big city. Mom and Dad decided to move us ON Halloween so they dropped us off at our Aunt’s house and she took us trick-or-treating in a community right outside of downtown Calgary. I went as a hippie. It was weird. Not the costume; I made the costume and it was awesome, but the fact that we didn’t know anyone, we didn’t get nearly as much candy as we would have back home, and when it came time to sort through our loot, our Aunt removed all of the homemade candy. That included the popcorn balls. 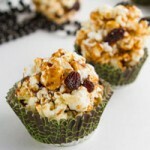 Those sweet, sweet popcorn balls. A couple of years after that, I learned that I was allergic to dairy and I never ate another popcorn ball again. Oh the tragedy of it all. 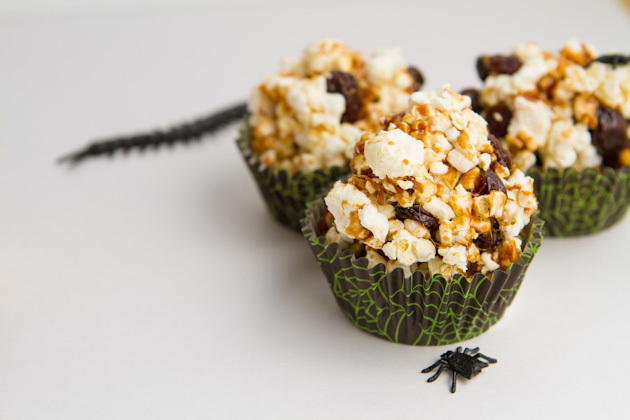 A life without caramel corn, popcorn balls, candy corn popcorn, chocolate popcorn… it was all off limits. Plus, dude… do you know how much refined sugars are in those things? I didn’t realize until I started planning this recipe. 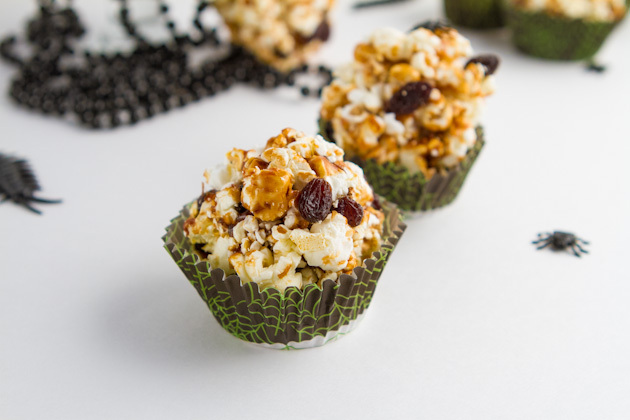 Although my cleaner version still has quite a bit of sugar, it’s no where near as crazy as the classic caramel popcorn ball recipe. 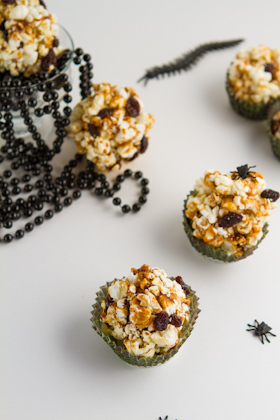 And hey, my version has raisins…rrr creepy, crawly ants. They’re considered a fruit, right? 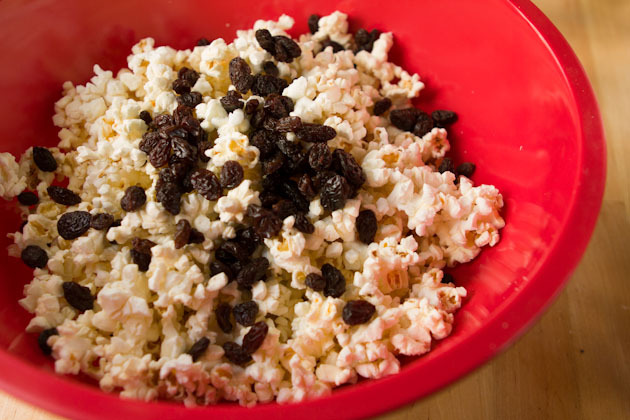 Place popcorn and raisins in a large bowl. Set aside. Add remaining ingredients to a small saucepan and bring to a boil on medium heat, stirring constantly. Reduce heat to a simmer and continue to simmer until thick, about 3 minutes. Any more than this and the mixture will become taffy-like and be impossible to work with. You want to remove it from the heat just before it begins to smell charred or burnt. 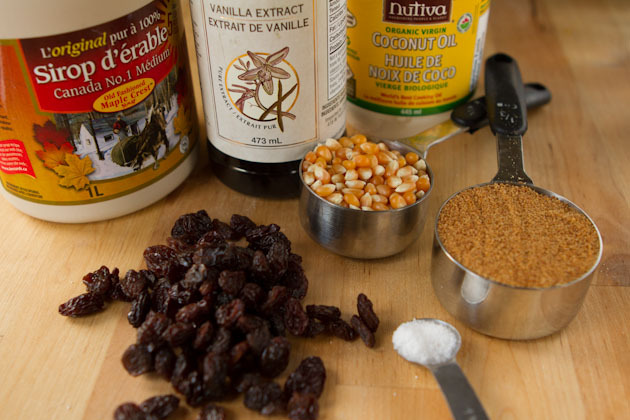 Remove from heat and quickly drizzle over popcorn mixture. You have to work quick with this next step, but avoid being burned by the hot sugar mix. Fluff it around with your hands until most is covered, then when it's cooled slightly (a couple of seconds is all it needs), begin to work into balls. Press mixture firmly together, the sugar is very sticky so it will stick, you just have to press it together. If there are extra raisins at the bottom of the bowl afterward, wedge them into the sides of the balls. For those sensitive to corn, popped sorghum can be used in it’s place. You have to work quick with this recipe. I wish I could have taken process pictures to demonstrate how it works, but there was just no time. The caramel hardens really fast so you just have to drizzle on while shaking the bowl and do your best not to burn your hands. There will be leftover bits at the bottom of the bowl. I had about 1 cup of popcorn that just didn’t have enough caramel on it to make another ball but there was still enough that I could put it in a bowl and snack on it for the afternoon! 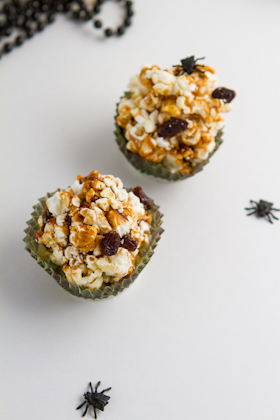 If you’re not attached to the whole popcorn ball thing you could decrease the sugar mixture by half and just drizzle the hot mixture on your popcorn, toss it around a bit and indulge in a bowl of caramel corn. Kevin and I made some for snack last night and it was deeelicious. Although I didn’t get much of it. Kevin loves caramel popcorn!